Since the Presidential Election is looming in our midst I thought I’d write my first blog entry on an event that encourages the American public to get out and vote. 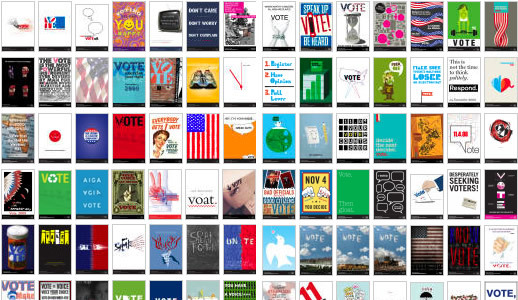 Over 200 Posters were submitted for AIGA’s “Get out the Vote” campaign, by designers from all over the nation. This Design for Democracy initiative has been alive since 2000 and has the mission of encouraging the American public to get to the poles and vote. Among the over 220 submissions, 12 were selected to appear with 38 others curated by Darrin Alfred in two concurrent digital exhibitions: the first, at the Denver Art Museum during the Democratic National Convention, and the second, at the Walker Art Center in Minneapolis during the Republican National Convention. Both museums will be projecting the set of posters for thousands of visitors, politicos, and media personnel attending the venues during the month of the conventions. Please spread the word about the exhibition and encourage others to visit AIGA’s online gallery where the 50 projected posters and the full suite of submissions are available to view, download and print. The purpose isn’t just to look, but to change behavior. You can even view, download and print the poster I submitted:) Get out the Vote, and remember, Good design makes choices clear. There are some really good posters! MUMU Grill is famous for the fact that the name was chosen after a drunken night of your mum jokes.It was going to be called YOUR MUM, then later it was shortened to U MUM, however, so as to not offend all the mummy's boys of the world it was decided that MUMU would be more apoeppriatr. The beauty of using this arrangement meant that people would think it had more to do with cows as opposed to mums.